For the 1996 film of the same name, see Gotti (1996 film). First announced in 2010, the film languished in development hell for several years with numerous directors and actors, including Barry Levinson and Al Pacino, attached at various points. Principal photography finally began in July 2016 in Cincinnati, Ohio and concluded in Brooklyn, New York in February 2017. The film was originally set to be released in the United States on December 15, 2017, but, just two weeks prior, Lionsgate, the slated distributor, sold the film back to its producers and studio, delaying its release. On March 12, 2018, its new release date was announced for June 15, 2018 by Vertical Entertainment and MoviePass Ventures, after premiering at the 2018 Cannes Film Festival. Gotti was both a critical and commercial failure. It grossed just $6 million against a production budget of $10 million, and was panned by critics, who lamented the writing, aesthetics and performances, although its use of makeup received some praise. It is one of the few films to hold an approval rating of 0% on the website Rotten Tomatoes. At the 39th Golden Raspberry Awards, the film was nominated for six Razzies, including Worst Picture and Worst Actor for Travolta. The film chronicles the three-decade reign of crime boss John Gotti, and his rise as the head of the Gambino Crime Family in New York City, along with his son, John "Junior", and his loyal wife, Victoria. In September 2010, Fiore Films announced that it had secured the rights from Gotti Jr. to produce a film about his life. The film, tentatively titled Gotti: In the Shadow of My Father, was to be directed by Barry Levinson, who eventually left the project. Nick Cassavetes and Joe Johnston were then also attached at different points to direct, as were Al Pacino, Lindsay Lohan and Ben Foster to star in various roles. Joe Pesci was cast as Angelo Ruggiero early in development and gained 30 pounds in order to properly portray him. After having his salary cut and being recast as Lucchese underboss Anthony Casso, he sued Fiore Films for $3 million; the case was settled out of court. Chazz Palminteri, who had played Paul Castellano in the TNT made-for-TV film Boss of Bosses, was also initially cast to reprise Gotti's predecessor. On September 8, 2015, it was announced that the project was moving forward with Kevin Connolly as director. Emmett/Furla/Oasis Films, Fiore Films and Herrick Entertainment would be financing the film, with Lionsgate Premiere handling the domestic distribution rights. On July 27, 2016, the complete cast for the film was announced. It included Kelly Preston as Gotti's wife Victoria; Stacy Keach as Aniello Dellacroce, the underboss of the Gambino crime family who mentored Gotti; Pruitt Taylor Vince as Angelo Ruggiero, a deferential friend of Gotti; Spencer Lofranco as John Gotti Jr., Gotti's son; William DeMeo as Sammy Gravano, Gotti's right hand man who later became an FBI informant and helped them in bringing down Gotti; Leo Rossi as Bartholomew "Bobby" Boriello, Gotti's enforcer; Victor Gojcaj as Father Murphy, with Tyler Jon Olson and Megan Leonard. Principal photography on the film began in Cincinnati, Ohio, on July 25, 2016, with locations including Springfield Township. The locations were staged to resemble setting of the film, New York City. Filming also took place on Jonfred Court in Finneytown, and Indian Hill. Filming was also done at Butler County Jail. The film's shooting was previously scheduled to take place in New York City, because of its setting there, but it was relocated to Cincinnati. One reason to relocate was Ohio's revised Motion Picture Tax Credit to benefit films' creators. Filming for some scenes took place in Brooklyn on February 21, 2017, concluding principal photography. The film was originally set to be released in a limited release and through video on demand on December 15, 2017, through Lionsgate Premiere. Producers began seeking a new distributor in order for the film to receive a wide theatrical release, as opposed to the original release it was initially intended to have, with Lionsgate selling the film back to the producers and studio. On March 12, 2018, Connolly announced that the film would be released on June 15, 2018. On April 12, 2018, it was announced Vertical Entertainment was the film's new distributor. On April 25, 2018, it was announced that MoviePass Ventures, a subsidiary of MoviePass, acquired an equity stake in the film and will participate in the revenue generated from the film. The film premiered at the 2018 Cannes Film Festival on May 15, 2018. Gotti grossed $4.3 million in the United States, and $1.8 million in other territories, for a worldwide total of $6.1 million, against a production budget of $10 million. Gotti began its limited release in 503 theaters and was projected to make $1–2 million in its opening weekend. It made $105,000 from Thursday night previews at 350 theaters and a total of $1.7 million in its opening weekend, finishing 12th. According to their own reports, MoviePass accounted for 40% of tickets sold, leading one independent studio head to tell Deadline Hollywood: "It used to be in distribution, we’d all gossip whether a studio was buying tickets to their own movie to goose their opening. But in the case of MoviePass, there’s no secret: They’re literally buying the tickets to their own movie!" In its second weekend the film dropped 53% and made $812,000, finishing 12th. Gotti was not screened in advance for critics, but the Cannes premiere was attended by reviewers from IndieWire and The Hollywood Reporter, who both gave the film negative reviews. On review aggregator Rotten Tomatoes, the film holds an approval rating of 0% based on 54 reviews, and an average rating of 2.1/10. The website's critical consensus reads, "Fuhgeddaboudit." On Metacritic, the film has a weighted average score of 24 out of 100, based on reviews from 16 critics, indicating "generally unfavorable reviews". Jordan Mintzer of The Hollywood Reporter gave the film a negative review, writing: "... it's not only that the film is pretty terrible: poorly written, devoid of tension, ridiculous in spots and just plain dull in others. But the fact that it mostly portrays John Gotti as a loving family man and altogether likable guy, and his son John Gotti Jr. as a victim of government persecution, may be a first in the history of the genre." The New York Post's Johnny Oleksinski called the film "the worst mob movie of all-time" and wrote, "... the long-awaited biopic about the Gambino crime boss' rise from made man to top dog took four directors, 44 producers and eight years to make. It shows. The finished product belongs in a cement bucket at the bottom of the river." Writing for Rolling Stone, Peter Travers gave the film one out of four stars and said, "Insane testimonials from Gotti supporters at the end are as close as this [film] will ever get to good reviews." Observers were quick to note a large disparity on Rotten Tomatoes, between the audience approval score of 80% and the 0% critics' score during the film's opening weekend. As of March 25, 2019[update], the audience score was down 33 points to a score of 47%. On June 19, Dan Murrell of Screen Junkies noted that the disparity "made no sense" and suspected vote manipulation on behalf of the studio. Accusations against the production studio and marketing team increased after the release of a marketing push suspected to be trying to hit back at the critics. The campaign proclaimed to consumers to ignore the "... trolls behind a keyboard", and "Audiences loved Gotti but critics don't want you to see it... The question is why??? Trust the people and see it for yourself!" Observers also noted the abnormally high number of reviews, 7,000, compared to other films that did better at the box office that weekend, such as Incredibles 2 which logged 7,600 reviews and grossed 105 times more than Gotti. Rotten Tomatoes staff issued a statement stating they didn't find any evidence of tampering and that "All of the ratings and reviews were left by active accounts." As of June 19, 32 of the 54 written reviews were found to be from first-time reviewers on the site, who had also only left a review for Gotti itself, and 45 of the accounts were created the same month. Many of the accounts also wrote a review for American Animals, which along with Gotti are the only films to be owned by MoviePass through its company MoviePass Ventures, which was responsible for 40% of tickets sold. Jim Vorel of Paste suggested this was done to try to prop up MoviePass's "unlimited movies" business model. ^ a b McClintock, Pamela (May 3, 2018). "Pitbull Makes Film Composing Debut With John Travolta's 'Gotti' (Exclusive)". The Hollywood Reporter. Penske Business Media. Retrieved June 14, 2018. ^ a b Hipes, Patrick (April 12, 2018). "'Gotti' Sets Deal With Vertical Entertainment for June Release". Deadline Hollywood. Penske Business Media. Retrieved April 15, 2018. ^ "GOTTI" (PDF). Lionsgate Premiere. Lionsgate Publicity. Retrieved October 22, 2017. ^ a b Jordan Mintzer (June 14, 2018). "'Gotti': Film Review - Cannes 2018". The Hollywood Reporter. Retrieved May 15, 2018. ^ a b "Gotti (2018)". The Numbers. Retrieved July 6, 2018. ^ Rottenberg, Josh. 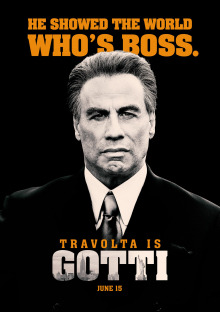 "John Travolta's 'Gotti' biopic bumped from schedule just days before its planned release". Los Angeles Times. Retrieved July 10, 2018. ^ Harris, Hunter. "John Travolta's Delayed Gotti Movie Gets a Summer Release". Vulture. Retrieved July 10, 2018. ^ Perez, Lexi (June 15, 2018). "'Gotti': What the Critics Are Saying". The Hollywood Reporter. Prometheus Global Media. Retrieved June 15, 2018. ^ Coogan, Devan (June 15, 2018). "John Travolta's Gotti earns zero percent on Rotten Tomatoes". Entertainment Weekly. TIME. Retrieved June 18, 2018. ^ Kiefer, Halle (June 15, 2018). "John Travolta's Gotti Currently Has a Zero Percent on Rotten Tomatoes". Vulture. New York Media. Retrieved June 18, 2018. ^ Kilday, Gregg (June 15, 2018). "John Travolta's 'Gotti' Gets Rare Zero Percent Score on Rotten Tomatoes". The Hollywood Reporter. Prometheus Global Media. Retrieved June 18, 2018. ^ McNary, Dave (September 22, 2010). "Fiore to bring John Gotti, Jr. to big screen". Variety. Penske Business Media. Retrieved June 18, 2018. ^ a b D'Alessandro, Anthony (June 17, 2018). "'Incredibles 2' Even Stronger As Pixar Pic Soars To Amazing $181M – Early Sunday Update". Deadline Hollywood. Penske Business Media. Retrieved June 17, 2018. ^ Powers, Lindsay (June 28, 2011). "Joe Pesci Sues 'Gotti' Producers for $3 Million". The Hollywood Reporter. Prometheus Global Media. Retrieved June 17, 2018. ^ CBSNews.com (February 5, 2013). "Joe Pesci settles dispute over "Gotti" film payday". CBS News. CBS. Associated Press. Retrieved June 17, 2018. ^ Jagernauth, Kevin (August 24, 2011). "Chazz Palminteri Will Play Mafia Boss Paul Castellano (Again) In 'Gotti: In The Shadow Of My Father'". IndieWire. Penske Business Media. Retrieved June 17, 2018. ^ a b Fleming, Mike Jr. (September 8, 2015). "'Gotti' Mob Movie Back On; Kevin Connolly Directing John Travolta, Lionsgate Premiere Releasing: Toronto". Deadline Hollywood. Penske Business Media. Retrieved September 10, 2016. ^ Fleming, Mike Jr. (July 27, 2016). "'The Life And Death Of John Gotti' Cast Locked". Deadline Hollywood. Penske Business Media. Retrieved September 8, 2016. ^ Mains, Brian (July 25, 2016). "'The Life and Death of John Gotti' stars, director spotted in Cincinnati". WCPO. E. W. Scripps Company. Retrieved September 8, 2016. ^ a b Motsinger, Carol; Steigerwald, Shauna; Milam, Brett (July 28, 2016). "John Travolta filming 'Gotti' movie in Finneytown". The Cincinnati Enquirer. Gannett Company. Retrieved September 8, 2016. ^ Guaderrama, Robert (August 2, 2016). "Gotti movie to film in Indian Hill Tuesday". Fox19. Raycom Media. Retrieved September 11, 2016. ^ Pack, Lauren (August 16, 2016). "John Travolta mob movie filming scenes in Butler County". Journal-News. Cox Media Group. Retrieved September 11, 2016. ^ Fears, Danika (July 14, 2016). "Biopic on mob boss John Gotti won't be filming in New York City". New York Post. NYP Holdings. Retrieved September 8, 2016. ^ Melas, Chloe (February 23, 2017). "John Travolta transforms into John Gotti". CNN Entertainment. CNN. Retrieved November 13, 2017. ^ Kennedy, Michael (December 6, 2017). "Gotti: John Travolta Biopic Dropped by Lionsgate at Producers' Request". Screen Rant. Retrieved December 6, 2017. ^ Erbland, Kate (December 5, 2017). "Lionsgate Drops John Travolta-Starring 'Gotti' Film Ten Days Before Release — Report". IndieWire. Penske Business Media. Retrieved December 5, 2017. ^ D'Alessandro, Anthony (March 12, 2018). "Kevin Connolly Announces Summer Release Date For John Travolta 'Gotti' Pic". Deadline Hollywood. Penske Business Media. Retrieved June 14, 2018. ^ Pollack PR Marketing Group (April 25, 2018). "MoviePass Ventures Acquires Stake in Gotti Movie". BusinessWire. Berkshire Hathaway. Retrieved June 14, 2018. ^ Pollack PR Marketing Group (April 25, 2018). "MoviePass Ventures Acquires Stake in Gotti Movie". Helios and Matheson Analytics. Retrieved June 14, 2018. ^ a b D'Alessandro, Anthony (June 17, 2018). "MoviePass Reps 40% Of 'Gotti's $1.67M Opening As Critics Slaughter John Travolta Mob Pic". Deadline Hollywood. Penske Business Media. Retrieved June 17, 2018. ^ D'Alessandro, Anthony (June 24, 2018). "'Jurassic World: Fallen Kingdom' With $150M Reps Uni's 2nd Highest Opening Ever – Sunday". Deadline Hollywood. Penske Business Media. Retrieved June 24, 2018. ^ Nashawaty, Chris (June 15, 2018). "A very good John Travolta can't save the very not-good Gotti: EW review". Entertainment Weekly. Time. Retrieved June 19, 2018. ^ Kaufman, Amy (June 18, 2018). "John Travolta's 'Gotti' had a rocky road to the Cannes Film Festival and the challenges aren't over yet". Los Angeles Times. Retrieved June 19, 2018. ^ a b "Gotti (2018)". Rotten Tomatoes. Fandango Media. Retrieved March 25, 2019. ^ "Gotti Reviews". Metacritic. CBS Interactive. Retrieved June 26, 2018. ^ D'Alessandro, Anthony (June 16, 2018). "Gotti' Gets Whacked With 0% Rotten Tomatoes Score: A Deeper Look". Deadline Hollywood. Penske Business Media. Retrieved June 17, 2018. ^ Travers, Peter (June 15, 2018). "'Gotti' Review: A Mobster Biopic That Deserves to Get Whacked". Rolling Stone. Retrieved June 18, 2018. ^ a b Kilday, Gregg (June 19, 2018). "As 'Gotti' Battles Critics, Its Rotten Tomatoes Audience Score Draws Questions". The Hollywood Reporter. Billboard-Hollywood Reporter Media Group. Retrieved June 20, 2018. ^ a b c d e f g Vorel, Jim (June 19, 2018). "Something Suspicious Is Happening With Rotten Tomatoes User Reviews for Gotti". Paste. Paste Media Group. Retrieved June 20, 2018. ^ a b Beck, Kellen (June 19, 2018). "'Gotti' appears to be posting fake positive reviews on Rotten Tomatoes". Mashable. Ziff Davis. Retrieved June 20, 2018. ^ a b c d Clark, Travis (June 19, 2018). "The positive Rotten Tomatoes audience score for 'Gotti' has raised suspicions after the movie's thrashing by critics". Business Insider. Insider. Retrieved June 20, 2018. ^ a b c Hibbard, James (June 19, 2018). "'Gotti' fires back at movie critics after terrible reviews: 'A troll behind a keyboard'". Entertainment Weekly. Time. Retrieved June 20, 2018. ^ "RAZZ NEWZ - The Razzies!". Razzies.com. January 21, 2019. Retrieved January 21, 2019.